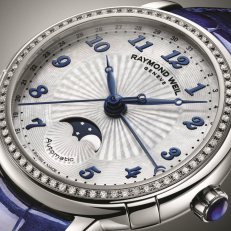 The round case of the novelty, water-resistant to 100 meters, is made of stainless steel. Case diameter is 42 mm and thickness is 13.7 mm. Fluted crown, located at 3 o'clock position, on the top is decorated with the brand’s logo. The front side of the case is equipped with an anti-reflective sapphire crystal, which has also been established on the screwed back side. Elegant silver dial is decorated with radiant finish. Grace of the dial is highlighted with the coating in rose gold, in which are clothed applied hour indices, hands and rims of the extra dials. At the periphery of the dial is placed a round tachometer scale. Time is indexed by means of the central hour and minute hands coated with white luminous substance, which provides superior data reading in any light. Small second’s hand is put on the lateral dial, located at 9 o'clock position. Date and day of the week are built into the respective apertures at the 3 o’clock position. The chronological functions are displayed on a 30-minute indicator at 12 o'clock position, 12-hour indicator at 6 o'clock position, and through the central second’s hand. The novelty Freelancer Steel & Rose Gold Class Ref: 7730-STC-65025 operates on a manufactory automatic mechanism RW5000 at 25 jewels. Reliable caliber has a 42-hour power reserve. The model Freelancer Steel & Rose Gold Class Ref: 7730-STC-65025 comes on a calfskin strap in dark brown color, equipped with a folding steel clasp. 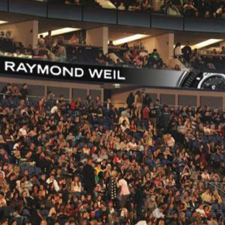 To buy the watch will be available through the authorized representatives of the company RAYMOND WEIL.